Alex Cubie was a Scottish animator, illustrator and comics artist. He is best known as one of the main artists to draw Mary Tourtel’s iconic ‘Rupert Bear’ newspaper strip during the 1960s and 1970s. Alex Cubie was born in 1911 in Renfrew, Scotland, not far from the capital Glasgow. He started out drawing cartoons for the newspaper Glasgow Evening Citizen. In 1934 he moved to London, where he created cartoons for The Daily Sketch and The Leader. When World War Two broke out in 1939, Cubie was drafted in the British army the following year. He originally worked as a fitter, before the army felt his artistic talent could be more useful in their design team, where he could draw lay-outs for tactical exercises. After the war Cubie returned to Fleet Street, where he designed greeting cards. In the late 1940s Cubie made a move to animation. He joined the Rank film company in Cookham. Around the same time one of Disney’s animation directors, David Hand, was in England to help out the Gaumont Company with their own locally produced animated films. Cubie became part of Hand’s British-based animation unit. Cubie was already an illustrator for the quarterly ‘Rupert Adventure Series’ books between 1952 and 1962, in alternation with Enid Ash. The heads of Rupert and his friends were sometimes filled in by Alfred Bestall. In 1951 Cubie became an illustrator and cartoonist for the Daily Express. 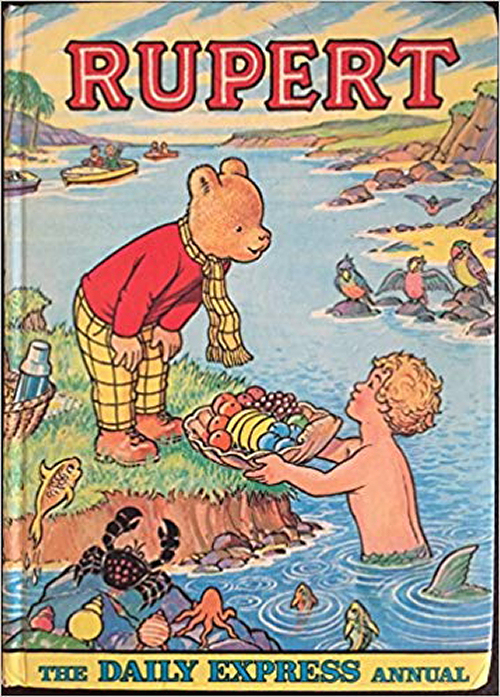 It wasn’t until 1965 before he was asked to become one of Alfred Bestall’s successors on the ‘Rupert Bear’ comic strip. Bestall was no longer physically able to continue the series and instantly retired (although he continued to provide artwork for the annuals until well into his 90s). Cubie drew adventures with the little white bear until 1978, with Freddie Chaplain providing the stories. Cubie had a more cartoony approach than Bestall and applied thicker black outlines around the characters. Apart from drawing the daily comic itself, Cubie also provided artwork for the annual ‘Rupert’ books between 1974 and 1978. Although Cubie produced most stories in the post-Bestall period, other artists who alternated on the stories were Lucy Matthews and Jenny Kisler. John Harrold also drew stories from 1976 onwards and was appointed as the full-time ‘Rupert’ artist in 1985. Alex Cubie passed away in 1995.